Smokescreen is the resident fixer for the Autobots; when a fight goes wrong, he cleans up the mess. Using an array of disruptive and disorienting weapons, Smokescreen confuses his enemies and obscures his allies as they regroup for a punishing counterattack. Smokescreen’s alternate mode is most closely related to a R35 Nissan GTR. They look pretty close to me, but there’s probably some subtle differences there. Anyways, the car mode is sleek and fast-looking. There’s good molded detail all around, and parts that need to be flat and smooth are, while grills and vents can be found where needed. The vast majority of color is made of blue and red, with some white details, racing numbers, and a tampo Autobot symbol on the hood. The windshield and side windows are done in black, as are the wheels – with silver rims. The paint detailing is stunning, and pictures really don’t do the car mode justice. Seeing it in person tells a different story; the red has a metal flake look to it, and the blue plastic is rather vibrant. The white details are not at all dull, and the silver rims really shine. The only issues I have is the light blue plastic on the sides (which really detracts from the flow) and the complete lack of painted headlights. Otherwise, the car mode is absolutely beautiful, and is the main reason why I picked up Smokescreen (honestly I really wanted Prowl, but this one was readily available and cheap). The car mode rolls really smoothly – nothing drags on the ground due to the robot parts being packed away tightly. If you so choose, you can peg Smokescreen’s gun (some sort of Cybertronian shotgun I believe) on either side down by the front fender, or as I prefer, on the top of the car pointing backward. You can also peg the included Combiner hand/foot/weapon on top, but I think doing so looks rather clunky, so I just leave that piece out. Otherwise, the car modes offers no other functionality, but it looks really good. 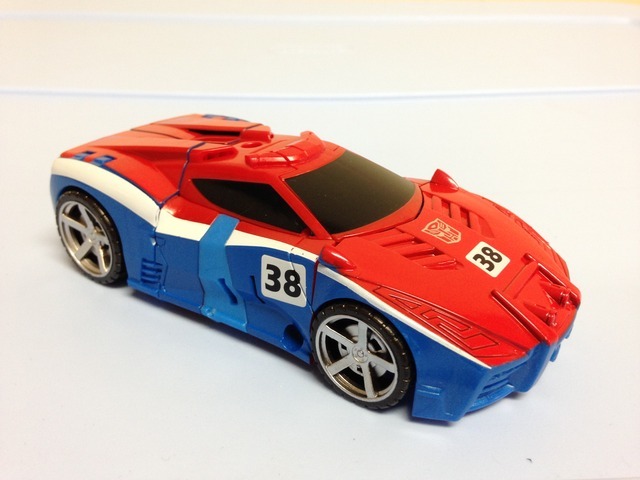 A quick and easy transformation from the car mode gets you into Smokescreen’s robot mode. For most figures, I prefer the robot mode – but I can’t honestly say that’s the case with Smokescreen. He doesn’t look bad, mind you, it’s just that this figure was repainted from Prowl, who was retooled from Streetwise, who was himself retooled from Dead End. Being the fourth reuse of the mold, it’s blantantly obvious this figure wasn’t really intended to be Smokescreen. It works (in some fashion), but the heart is just not there. Inherently, there’s nothing wrong with the mold. There’s a lot of detail everywhere, and the color palette is striking and the paint apps are crisp. I’m not entirely sure if there was supposed to be a difference in blues, but there is. 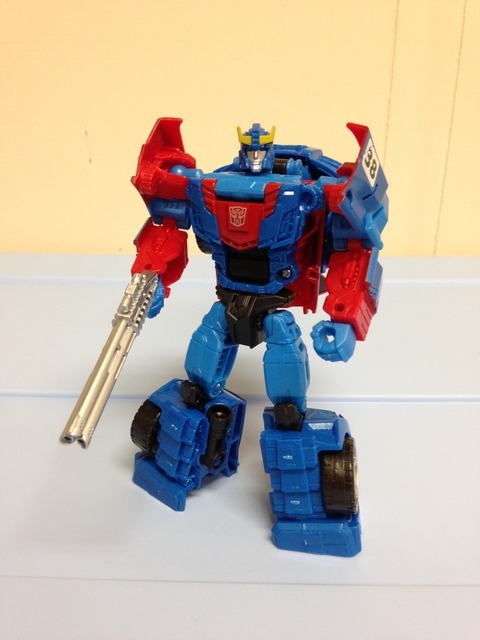 Look closely at his thighs, hands, and parts of the arm, and the blue color is lighter than the rest of Smokescreen. It’s a subtle way of breaking up the mass of blue, but I’m not sure if it’s intentional. Aside from the striking colors used - the blues and reds used really pop - Smokescreen could be considered bland. I like his look, but he bears little resemblance to his traditional features. Articulation is pretty good, with the hips being ball & swivel jointed, the waist swivel jointed, elbow and upper arms swivel jointed, and the shoulders ball jointed. Smokescreen has a pretty good range of motion, but the shoulders can bump into the car parts on the back a bit. His feet are quite large and the joints are tight – you can get him into some really good action positions. 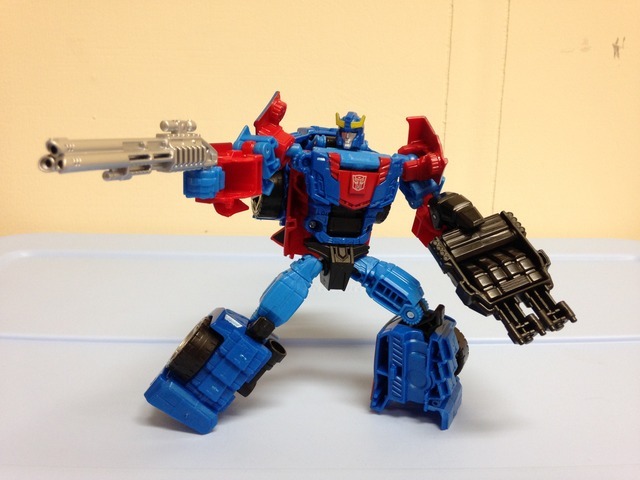 He also comes with the previously mentioned shotgun and combiner weapon, so there’s a tiny bit of other fun to have. Smokescreen is a solid figure, but doesn'’t offer anything outstanding. As standard with the Combiner Wars deluxes, Smokescreen can be used as either a leg or arm when combined with other figures in the line. Though originally intended for use with Sky Lynx to form Sky Reign, I use Smokescreen in conjunction with Battle Core Optimus Prime, Prowl, Trailbreaker, and Ironhide. The Combiner Wars line boasts a great gimmick of swapping arms and legs, various cores, and even Autobots and Decepticons if you choose to do so. 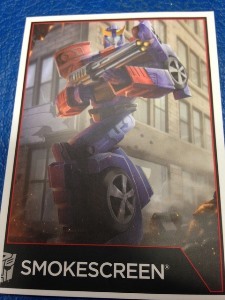 A lot of Smokescreen’s value comes from this feature, but as a standalone figure, Smokescreen will likely not carry the same value. Transformation Design: 5 Pretty straightforward on this one. On the plus side, it’s quick. Durability: 8 Good quality materials used, nothing seems flimsy. Fun: 6 As a standalone figure, Smokescreen is not great. As a combiner limb, this value goes up a tick. Aesthetics: 6 The silhouette doesn’t match your traditional Smokescreen, nor does the robot mode coloration. On the other hand, the car mode is absolutely beautiful. Articulation: 6 He's got joints and decent range. Nothing is hindered. Value/Price: [B]6[/B I got him at ‘clearance’ cost for the purpose of a combiner – a good value. Otherwise, traditional MSRP for a standalone deluxe isn’t good with Smokescreen. Overall: 5 Smokescreen is not a bad figure, just average. If he’s utilized as a combiner limb, he’s good. It’s obvious though, that this mold has been used several times over for other figures and Smokescreen is just a repaint of a retool of a retool.